Masonry chimneys should be at least three feet above the roof at the point they go through, and two feet higher than anything within 10 feet. Wood furnaces should not be located in small confined spaces (less than 20% of the entire space they are designed to heat). The flue pipe of a wood stove needs 18 inches of clearance from combustibles. Many insurance companies won’t insure homes with wood stoves until they have evidence that the unit is listed or certified or has been inspected. Radiant stoves emit heat by radiation. Convective stoves emit heat by convection. Convective stoves are cooler, safer and may have reduced combustible clearances. Electric heating is one of the simplest heating systems to inspect. 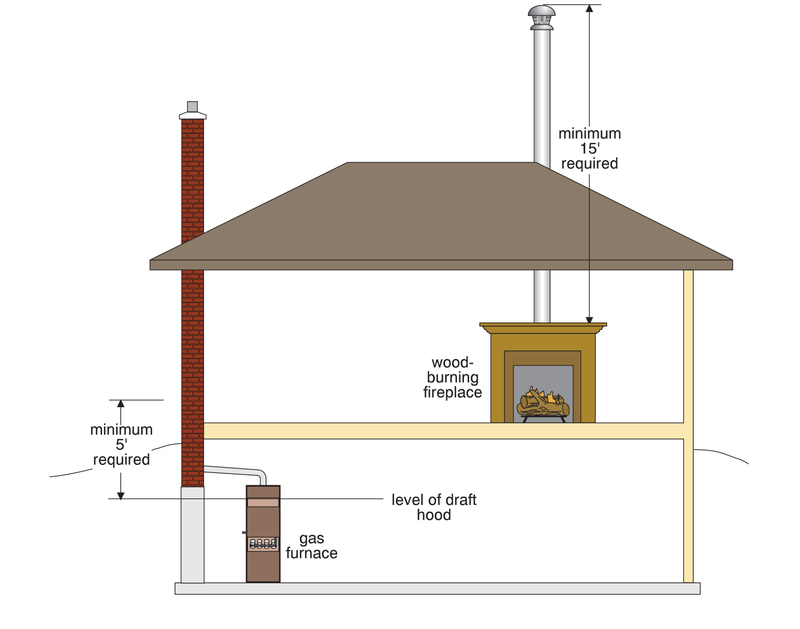 Chimney height above appliance — This illustration shows height rules and minimum requirements for wood and gas appliances. All of our 10 Courses contain easy-to-understand illustrations that help you understand the subject. This illustration is from our Heating II Course.